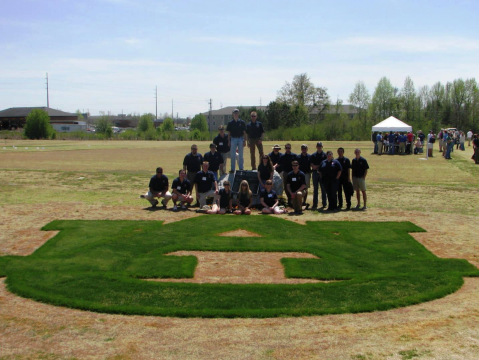 It was Auburn’s Turfgrass Research Field Day yesterday, and nothing says “Auburn Turfgrass” like a giant Auburn logo in turfgrass. Or technically, dormant bermuda grass overseeded with perennial ryegrass. But you get the idea. Auburn fans have a proud history of showing spirit with ryegrass. Just remember, Bama—you can’t really call it “vandalism” if it actually improves an environment. Photo: AU Turfgrass Management Facebook page. Related: Ryegrass reminder of Iron Bowl score planted at Bryant-Denny.